Tree Roots and Broken Pipes | Mr. Tree, Inc.
Why Should You Prune Your Tree? Trees are a beautiful way to enhance the beauty of your local community. They protect homes from wind, they keep the air clean, and they provide shade on hot summer days. However, trees are capable of causing a good deal of structural damage to communities as well. Generally, this is caused by poor planning when it comes to planting trees or to choosing them, and that’s when people generally call us for tree removal in Portland. When a tree grows, it is the roots that anchor the tree in the soil; they are the part of the tree that collect water and nutrients while keeping the tree stable. Plants have the ability to sense water and nutrients in their environments and seek them out perforce. Once they locate the nutrients, they begin to move towards the source; the vascular structures of the plant draw the water and nutrition up into the rest of the tree. In fact, the roots are capable of growing up to three times the diameter of the branches. This means that for any tree that you can see, a great deal of it is underground; this is also why tree removal is more than simply chopping down a tree. Tree roots are extremely strong structures, and they spread through the ground as the tree grows. This is a slow process since trees take years to grow, but as the roots become larger, they displace the soil that they’re planted in, pushing it up out of the way while they search for water. As the soil is pushed upwards by the roots, it pushes everything around it upwards too. So if the soil happens to be sitting under some pipes or a sidewalk then those structures will become damaged. 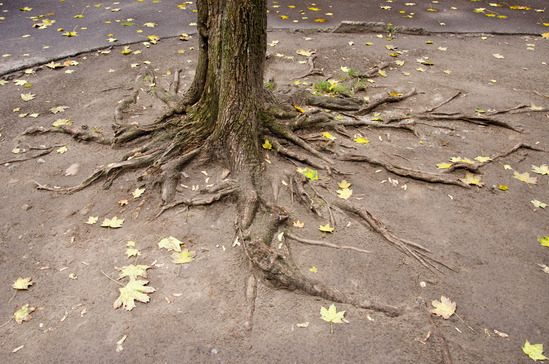 Tree roots place a huge amount of pressure upon the soil underneath sidewalks. Especially in older sidewalks, the tree roots can raise up the concrete and crack the cement. This is not only aesthetically displeasing, but it’s damaging to the entire landscape (potentially the foundation of the house), not to mention a tripping hazard. As the roots surface, they can even cause a problem for drivers which increases the dangers exponentially. Pipes in particular are susceptible to damage from tree growth since most pipes have one essential function: transport water. As mentioned beforehand, tree roots are adapted to seek out water wherever it may be and, as a result, the roots begin growing towards underground pipes. Since they are much wider than the above ground part of the tree, root systems can be huge. As the pipes get older, they can more easily be cracked by even a small displacement of soil. Once this occurs, the tree roots will begin moving into the openings in the pipes, clogging them and preventing them from doing their job. Tree roots can also cause other leaks further up the pipeline and the repair process for this type of damage can be extensive! For that reason alone, the best method for handling this is prevention. The first step to prevent pipe damage should be taken before you ever plant the trees. If you have any control over this, you should study what the best tree species are for planting in your particular environment. Some examples of trees that minimize damage to the area they grow in include maple trees – which grow quickly, up to three feet a year – and their roots generally don’t cause damage. In addition, pagoda trees, horse chestnuts, and buckeyes are other tree types that prevent damage. Certain type of oaks are non-invasive, as well as dogwood, gingko, magnolia, cherry laurels, and a variety of others depending on your location. Check your local Parks and Recreation department’s website, which may have a list of the best type of trees to use to prevent roots attacking pipes. Of course, it’s very possible you don’t have control over which trees are being planted in your area. For instance, if you move into a home as is and don’t set aside budget for landscaping. That said, there are a number of steps that one can take to control the growth of roots and prevent them from clogging underground pipes. One fix that can be effective is the application of tree root barriers. Tree root barriers can be made of corrosion resistant metals, fiberglass, or plastic and they provide a wall that roots cannot get through. When used correctly, tree root barriers can redirect roots away from pipes, sidewalks, and other structures that you wish them to avoid. Care must be taken, because if the tree root barriers are installed incorrectly they can fail to protect the area or they can even do damage to the tree itself. Additionally, they can also prevent water from draining properly, so make sure when using barriers that their use is planned properly. The root barriers need to reach at least two feet underground; tilling the soil that your tree is planted in can make installation easier while also influencing the direction the tree roots grow. One method you want to avoid at all costs is the use of tree growth retardants. While these do prevent the visible part of the tree from growing larger, trees tend to redirect the energy that would be used to grow the trunk and branches downwards towards the roots, making them grow even more. If placing barriers isn’t proving to be effective, the only alternative is tree removal. After doing this, the tree stump must be ground or it’s possible the roots will continue to grow. Ultimately, proper planning is the best way to protect your pipes from uncontrolled invasive tree growth, but if that was never an option, there’s no need to fear. As Mr. Tree will help you with your tree removal in Portland.